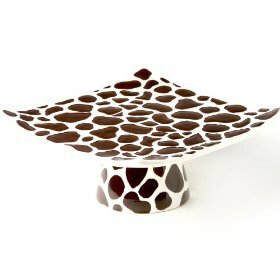 Warm up your party with this chic giraffe cake plate for your treats. Designed in California by Laurie Gates. Composed of high-fired ceramic earthenware. Dishwasher-safe; Microwave at low settings only as item become warm/hot to touch after heating. Use precautions when removing item from microwave. Made in China. Laurie Gates Inc. is and always will be about providing fun and fashionable dinnerware and tabletop accessories to people’s tables across the entire world. Headquartered in Los Angeles County, California, the 19-person company is owned and operated by Laurie Gates HIMself. Yes – Laurie is a man and not a woman, we’re sorry to say. His family roots are Irish and English and it wasn’t uncommon for men back in the day to be named Laurie. We all still chuckle here at the office when customers ask to speak to HER! Laurie’s products are available at many retailers worldwide. What separates Laurie Gates Designs from other manufacturers is that Laurie develops and produces all of his designs directly on the clay bisque themselves. How a pattern moves/looks on a dinner plate differs from that of a soup bowl, mug, or serving platter. No computers are used to design a pattern on dinnerware for example. Rather, each design is: a) individually hand-painted on the clay bisque, b) glazed, and c) fired in a kiln right in his studio. 1. New colors are developed continually to reflect the changing trends in fashion and design. Colors are developed right on the clay itself to enable a more valid and accurate representation. 2. New shapes and styles in dinnerware and serveware are also developed to provide options and to reflect the changing dining needs of families.